In small lakeside Guatemalan villages, artisans hand-dye small batches of bamboo thread in four to six colors creating the unique jaspe pattern found throughout these beautiful scarves. The thread for each scarf is warped on a warping board. The warp is then put on a backstop-loom and handwoven. When completed, fringed scarves are hand-knotted. Scarves are then hand-washed and laid out in the sun to dry. Fringed scarves measure 8 inches X 72 inches. Infinity scarves measure 10 3/4 inches X 68 inches. Each scarf is a unique product with slight variations in color and in pattern. *Bamboo thread is not manufactured in Guatemala. In fact, almost no thread is manufactured in Guatemala. Bamboo thread is made from organically grown bamboo in China. Likewise, cotton thread is imported from India. *Most arable land in Guatemala is used for export crops including bananas, pineapples, and palm oil for biofuels. 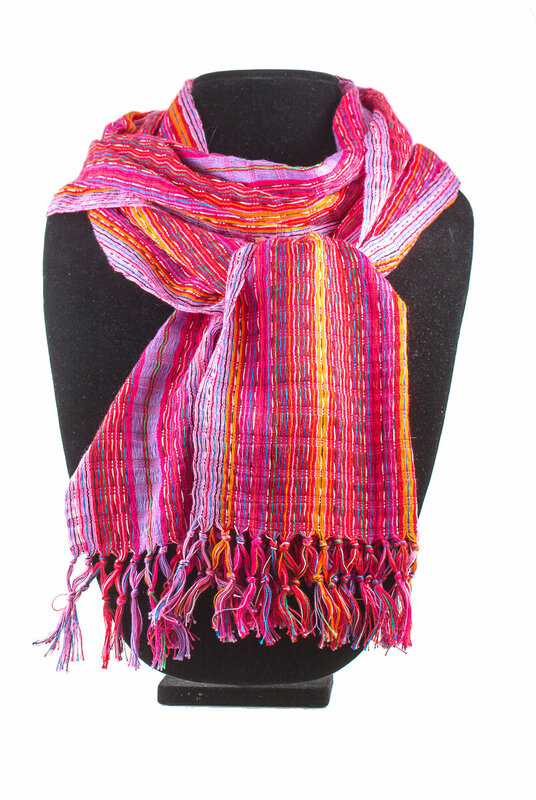 In addition to the beautiful handwoven bamboo scarves, our Guatemalan artisans have also created these gorgeous cotton scarves made in the same manner, using a backstop-loom.